Strong and goon in the air? FFS..we're desperate..but not that much. Are you actually saying he's not strong and good in the air?? I played as central defender for 20 years and I think he could make a decent short term solution. Greeting from a PNE fan. Firstly, welcome back to the Championship. It's a fun division. I just wanted to give you a bit of PNE perspective on this game. PNE are a decent Championship side - we've got limited budget and as such can't afford star players, but have a good manager and know what we're doing at this level. Finishing 7th last season meant we just missed out on the play-offs and we're optimistic of doing better this season. Very solid at the back and in midfield, our main weakness has been in the goal scoring department, especially when Maguire is out injured. Having picked up a couple of Man City youngsters on loan we're hoping they can add goals. 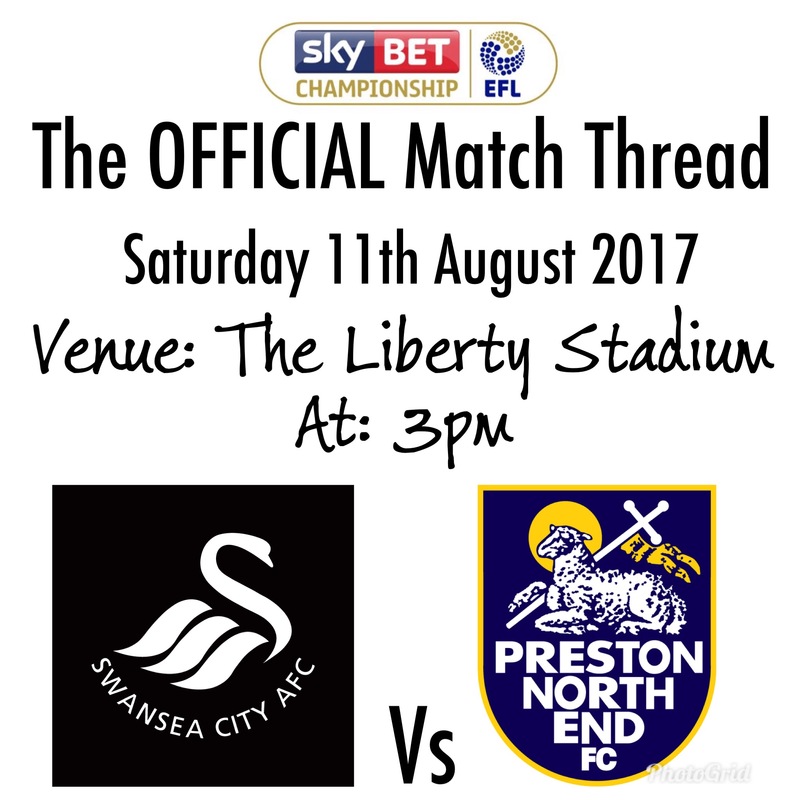 PNE expect a tough game, and relish in the #teamslikePreston which became a thing last season when some of the "bigger" teams couldn't understand why we kept taking points off them. In terms of individual players by value, Swansea should have more than us, but PNE are very streetwise at this level and Swansea will need to adapt quickly to life in the championship. Can't fault you mate, would like to see the likes of yourselves and Brentford upset the odds like we did a few years back, as long as it isn't instead of us doing it again. Went to Preston a few years back on a p*ss up tour, is Brown's still open with the rotating dance floor? F*ck me that place was rough. Thanks for the friendly response. I also like what Brentford are doing. Brown's has fortunately been closed for a while. Out of interest, do you still think this match will be easier than Sheff Utd away? I think we're a worse team without Fede, certainly. They are a team of cloggers, quite aggressive, expect a few bookings and a possible injury, I would say a tight two-one win, but to be honest, this is the Championship and anything could happen it's the hardest League to predict !!! I wouldn't class PNE as cloggers, but we did have a very poor disciplinary record last season! If we concede this will turn very, very toxic..
Just like few months back at West Ham when the fans went bonkers during their Burnley match which they lost 0-3. I'm expecting a horrid event..truly..We'll be on news for days and days for the whole world to make fun of us..Shambles FC. We are one (key) player down from last weeks starting line up. We are also home, but not really sure that's an advantage at this moment in time given the current "climate". I just hope t doesn't turn nasty cos that is a young team. When we guess at other peoples motives, we reveal only our own. Your team looks decent and well organised. Maybe Nmecha can give you that extra finishing quality but not tomorrow. Long time ago but 3-1 win to gain promotion in 81/2 is still one of my favourite away trips. It'll be a tight game tomorrow. Isn't Nmecha one of the players we were after? It would be ironic if he scored against us. Yup. He personally tweeted he was joining us. No doubt no money for his wages / loan fee. He's nailed on to score! ‘In terms of individuals players by value you should beat us’ anything of any value has been sold. ‘Your main weakness in attack’ should have a decent chance tomorrow we’ve got 1 centre half the rest have been flogged off to keep our ‘US investors’ happy. Enjoy your trip to Wales if you stay in the championship I’d expect it will be for a trip to them up the road. Tomorrow’s team from what I’ve been told. So a back 3 of Naughton VDH Olsson. Interesting. Poll: Which team would win? I'm going to the game going to have a couple of pints enjoy the match, whatever happens. Feeling blessed that I am out the house where all the talk is about youngest daughter's wedding next month, thankfully on the International break Saturday and son moving into his first house with his girl friend and all the little jobs that need doing, that Dad can sort out. People expect me to be stressed about our transfer window11 COYS. Think family will believe me if i get home late saying there was extra time? Never knew getting old would happen so quick! If we win tomorrow and put on a show ,all this crap of theses last few days will soon be forgotten ,should we lose and keep on losing ending up on the road to relegation yet again, we now have enough ammo to crucify treacherous Huw and the yanks ,but who will nail them up there ? the Trust? by things turning horrid I take it you mean a few boos ringing out from the crowd and apart from a few 'get out of our club chants' 90% of the crowd will remain quiet and rooted to their seats and then get up at the final whistle and go home moaning? My methods are not favoured by some but by god i speak the truth. Poll: An Independent Wales but stay in the EU??? Unfortunately I think this will go Preston’s way, I think Thursdays dealings will have taken some of the confidence out of the squad. Hope I am wrong and the players on the field step up and give a good account of themselves. i’d be disappointed if that was the team and rodon wasn’t given a chance. perfect opportunity to drop him in, i’d be p’ssed off if i was him and not starting. 3/5 at the back makes me shudder after being scarred by carvalhal last season; if we do play it, we’ve got to play high tempo stuff and not let pne settle.
" quite aggressive, expect a few bookings and a possible injury"
This could be a major problem for us. If they take the Leeds approach of a few years back and Target our players for a clattering it could not just affect this game. I had a vision then of Harry Secombe rising like a salmon in the area to nut home a cross from Andy Legge. Harry still wearing his glasses and the cross thrown in from the touch line. The ref, James Linnington...he is a man who I will never forgive, a grade A bellwhiff. The worst ref I have ever witnessed in 35 years of watching the Swans. Could be fun!